Posted Sept. 19, 2016, 12:40 p.m.
Posted Feb. 11, 2016, 1:54 p.m.
Posted Aug. 14, 2015, 3:23 p.m.
Josue Rey Maldonado, a 2-year-old Latino, died Sunday, Aug. 10, 2014, after he was beaten in the 2300 block of Lewis Avenue in Signal Hill, according to Los Angeles County coroner's records. Signal Hill police officers became aware of the incident that morning, when they received a call about a baby not breathing, according to a Los Angeles County Sheriff's Department news release. When they arrived at the home, the officers found Maldonado bruised and unresponsive, according to the release. Maldonado was pronounced dead at a local hospital at 6:26 a.m., according to Los Angeles County coroner records. The toddler had bruising “all over his body,” including his hairline, face, ears, abdomen, chest, arms and legs, according to a petition filed in Los Angeles County Superior Court to remove the surviving sibling from his mother’s custody. The Sheriff's Department Homicide Bureau took over the investigation at the request of Signal Hill police. Investigators spent nearly a year examining the evidence, according to the district attorney's office. The coroner's office didn't rule the boy's death a homicide until recently, said sheriff's Lt. Steve Jauch. In the year before the boy died, The Times learned, his mother had twice been reported to authorities for putting her children's welfare in jeopardy. In each case, the children were left in her custody. Maldonado’s mother, Jessica Rey Cereceres, and her boyfriend, Samuel Aguilar, were charged Monday with abusing both of her children. The youngest child, a 1-year-old boy, was taken into protective custody and put into foster care after his brother died, Jauch said. The boyfriend, Aguilar, a 23-year-old Latino, was also charged with one count of murder, assault on a child causing death and injuring a girlfriend, according to a news release from the Los Angeles County district attorney’s office. Aguilar's arraignment is scheduled for Aug. 27 in Los Angeles County Superior Court in Long Beach. He is being held in lieu of $1.3 million bail. Jauch confirmed that Aguilar has been in jail since December 2014, when he was arrested on suspicion of witness intimidation and dissuasion. Jauch refused to elaborate, except to say the arrest was related to the child abuse investigation. 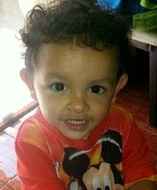 Maldonado’s mother, Cereceres, a 24-year-old Latina, was charged Tuesday with two counts of child abuse. Her arraignment is also set for Aug. 27 at Los Angeles County Superior Court in Long Beach, according to the district attorney's news release. Her bail has been set at $200,000. Cereceres has been cooperating with investigators, according to the Sheriff's Department. Jauch said the investigation is ongoing. Anyone with information is asked to call the Sheriff's Department Homicide Bureau at (323) 890-5500. Those wishing to remain anonymous should call Crime Stoppers at (800) 222-8477. — Albert Sanchez Feb. 26, 2017 at 4:32 p.m.
— Anon April 19, 2016 at 8:21 a.m.
— Ana Nov. 7, 2015 at 6:47 p.m.
— Joe Sept. 1, 2015 at 2:48 p.m.